Thanks to an X-ray survey of active supermassive black holes in the centres of galaxies conducted by NASA’s Swift satellite, scientists now have conclusive proof that galaxy mergers are one of the main triggers for many of these monster objects. A selection of the merging galaxies hosting active black holes imaged in visible light by the Kitt Peak observatory. 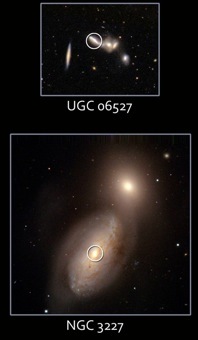 The locations of the AGN identified by Swift are circled. Image: NASA/Swift/NOAO/Michael Koss and Richard Mushotzky (University of Maryland). “These findings indicate that mergers play an important role in powering AGN,” adds Michael Koss, a graduate student at the University of Maryland who led the observations. 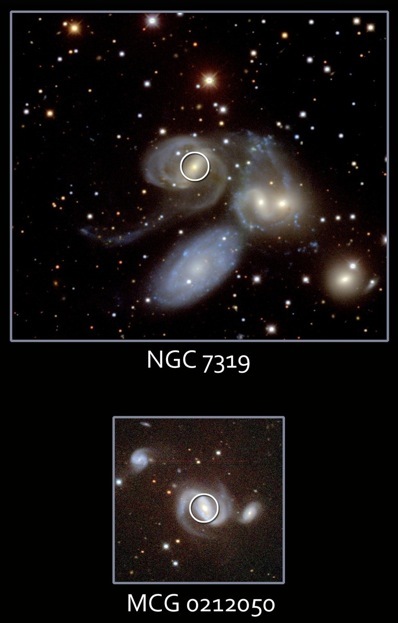 After identifying the AGN in X-rays, Koss used the two-metre telescope at Kitt Peak National Observatory to image the galaxies that hosted the AGN, and discovered that they were either in the process of merging, or were about to merge. “The majority of these AGN will undergo a merger in the next billion years,” says Koss. When two galaxies begin to encroach on one another’s territory, their respective gravity begins to pull and push on clouds of gas and the orbits of stars in each galaxy, diverting large quantities of matter down the mouths of their central black holes. These black holes often merge, and those in the BAT survey are estimated to have masses tens of billions of times greater than our Sun. 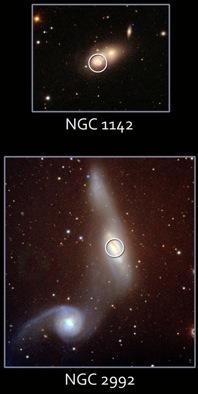 The observed AGN go out to a distance of 650 million light years (a redshift less than 0.05); a future NASA X-ray mission called NuSTAR, set to launch in 2012, will be able to seek out AGN up to at least seven billion light years away (a redshift of one), and astronomers will be keen to find out whether merger-triggered AGN were as dominant when the Universe was younger, and how any subtle differences between now and then might indicate how the process has changed over time.